With recovery of dues remaining a persistent problem, the Employees' Provident Fund Organisation (EPFO) is considering taking legal actions in a time--bound manner to achieve targets. Many a time it has been observed that the establishments concerned are deducting PF contribution from employees but do not make speedy contribution of the same to the EPFO office. 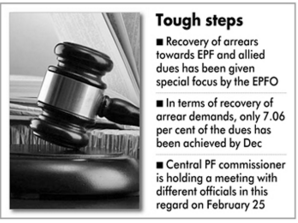 Recovery of arrears towards EPF and allied dues has been given special focus by the EPFO in the recent times. After analysing performance of field offices for the April-December 2015, EPFO has found that only 41.31 per cent of current demand has been met for the country as a whole when it comes to un-exempted and exempted establishments. Patna, Bangalore and Raipur offices were the worst performers, while Ahmedabad, Madurai and Baroda were the best.